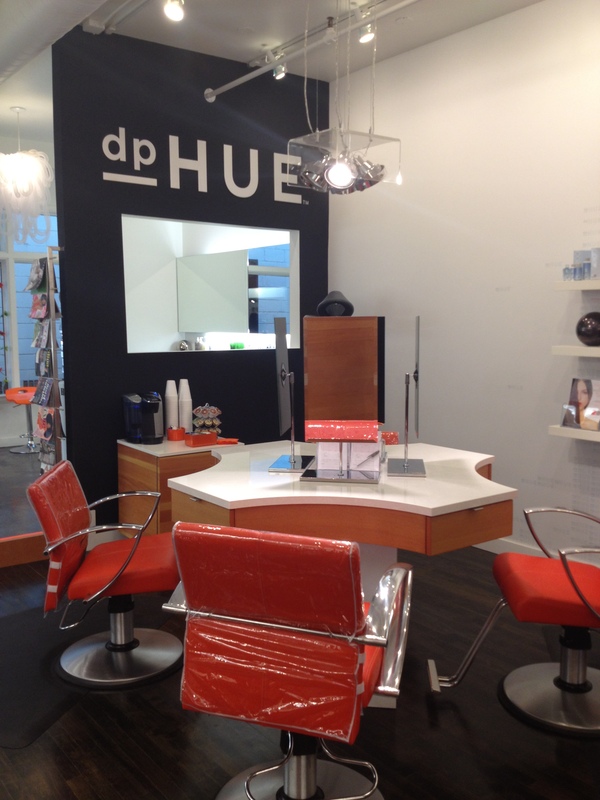 The new Color BAR at dpHUE offers in-house options as well as its innovative take-home hair color. Edina's dpHUE launches in-house color application--and so much more. Yesterday, I learned to color my own hair. Not from the side of a box found in a friendly pharmacy aisle, mind you, but from the professional color advisers and educators at dpHUE at 50th and France. The company, brain child of Donna Pohlad (yes, that Donna Pohlad), is just launching what it’s calling a Color Bar this month, expanding its current offering of do-it-yourself at-home high-end hair coloring to include a DIY “coached” in-store option (their retail space at 4944 France Ave. S. (suite LL100) is a ray of bright as the winter doldrums threaten and creep in), as well as full-service coloring by any one of six certified cosmetologists. And one thing is resounding: Anyone can do this, and everyone should try—at least once. Frustrated with scheduling difficulties when attempting to color her own hair, and wary of the questionable chemical substance of store-bought box colors, Pohlad first started researching the idea of this "middle option" in 2009; "it just made sense, and nobody else was doing it," daughter and dpHUE associate Maddy Persuitti says. "Any product out there, from cereal to shampoo to jewelry, has a more-affordable option, a high-end option and something in between. Why not color?" Open since 2011, dpHUE specializes in color matching and gray covering, but with the addition of the in-store options, highlighting, blow-dry styles and a plethora of products—including the highly popular dpHUE Oil Therapy, as well as masks, semi-permanent colors and guy dyes—the retail space is poised for growth. Currently, walk-ins are encouraged, though appointments can be made, too, and tips aren’t accepted, as these color pros consider themselves educators first, service providers sometimes and second. “It’s really formulated for beginners,” my color advisor Julia Hunkins told me yesterday, while showing me how easy it is to quadrant my own hair and generously brush the color in (the low-chemical formula sits for 45 minutes to set). “We offer lots of tools, tips and techniques, and we start with a very conservative, realistic all-over base [color] recommendation. We’re not trying to create the next Lady Gaga in here.” The on-site offerings really “take the fear out of the coloring process,” Pohlad says. Today, my hair is one shade richer, my hair shinier from the deep-conditioning and low-alkaline agents in the pigment-dense colors dpHUE discovered in Italy and customized on-site for my hair, and what’s more, I’ve been empowered to DP—do it (professionally) myself. & At least two more color shades and other products are coming in the next few weeks … stay tuned.